The 25th Annual Folly Beach Sea & Sand Festival is Saturday, April 11th. We’ll kick off the day like we always do with the Coffin Island 5K. 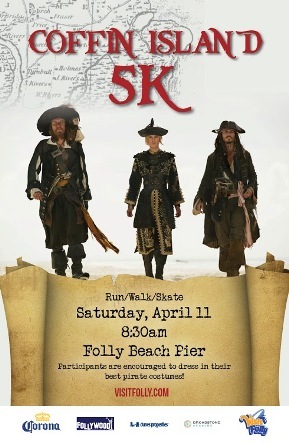 The Coffin Island 5K is a Pirate-Themed 5K With a Prize for the best dressed pirate!! You don’t have to dress like a Pirate, but wouldn’t it be more fun if you did!? Last year, about 50 of the 125 racers showed up in Pirate garb & had a blast – we hope you will this year, too! Folly Beach Island was also referred to as “Coffin Land” or “Coffin Island”. Legend has it that ships entering the Charleston Harbor after a long voyage, would drop off sick and dying cholera passengers so as to avoid quarantine restrictions on the mainland. The dead were eventually buried “in coffins” on the island. As you probably already know, Blackbeard’s floatilla was anchored off Folly Beach during the Siege of Charleston in 1718 & the Battle for Ft. Wagner took place at the tip of Folly Beach between Morris Island & what was then Coffin Island.